I was originally going to see the screening of "Never Let Me Go" yesterday, but the screening of "It's Kind of a Funny Story" was at a theater a lot closer to me, so I decided to see that instead. It definitely exceeded my expectations, and there are a lot of good things to say about the movie, but overall I was not that impressed. Craig (Keir Gilchrist, TV's "United States of Tara") has been feeling suicidal and decides to check himself into a psych ward; however, he doesn't realize that they are going to keep him as a patient for the entire week. 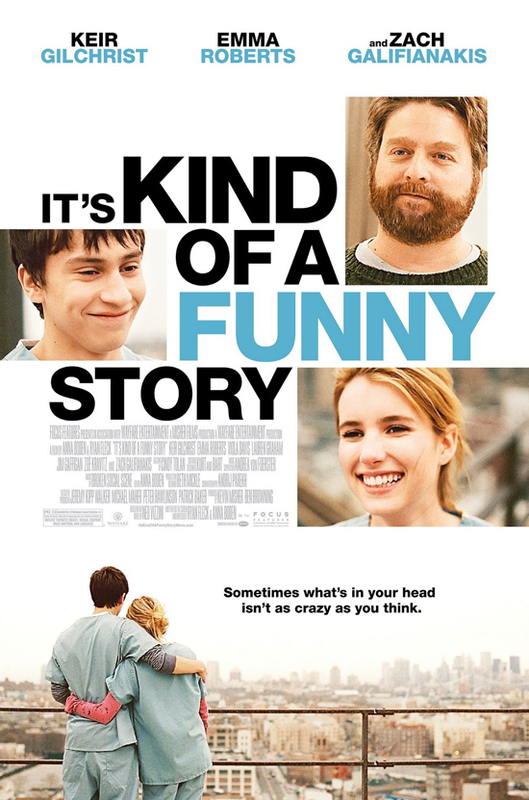 He meets a variety of characters there, including Bobby (Zach Galifianakis, "Dinner for Schmucks") and the beautiful Noelle (Emma Roberts, "Valentine's Day"), and although Craig doesn't t think he belongs there at first, he soon finds himself getting acclimated to the ward and its crazy inhabitants. The actors all do a great job in this movie, especially Gilchrist and Galifianakis, but the movie seemed a little slow to me at times. My favorite parts of the movie were when Craig would fantasize - for example, there is one scene where he is singing in front of the group at the psych ward, and in his mind he makes it into a rock 'n roll concert, with the residents all playing instruments and dressed up wacky. The supporting actors in the movie included Lauren Graham (TV's "Parenthood") and Jim Gaffigan ("Going the Distance") as Craig's parents, Zoe Kravitz ("Twelve") as the girlfriend of Craig's best friend, and Viola Davis ("Eat Pray Love") as Craig's doctor at the psych ward. Maybe see this movie. There are definitely a lot of things I liked about it, but there were some things I didn't as well. The characters all feel "real," which is good because movies that take place in psych wards can often be overdramatic (think "One Flew Over the Cuckoo's Nest"). I liked how Craig did learn a lot from his one week "locked up," and the movie had some interesting filming techniques that were good, some of which were seen in the trailer. The movie is narrated by Craig and that definitely helps the film interact with its viewers more, too. However, a lot of parts in the movie seemed slow to me, as I mentioned before, and I was bored during some of it, which is why it merits a "Maybe" instead of a "Yes." 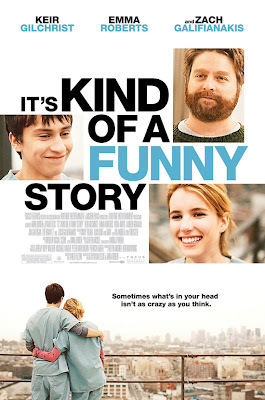 "It's Kind of a Funny Story" will be in theaters on October 8th.